Bring summer inside with this colorful Spring Watering Can pillowcase Pair. 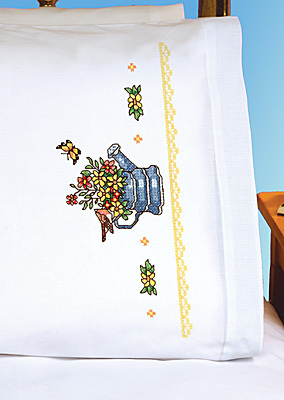 With flowers a bird and butterfly to accent this fabulous pillowcase you will love it. Designed by Sandra Garbrandt. Contains: Two polyester / cotton blend, machine washable, stamped pillowcases, graph, instructions. Approx. 20" x 30" Floss not included.